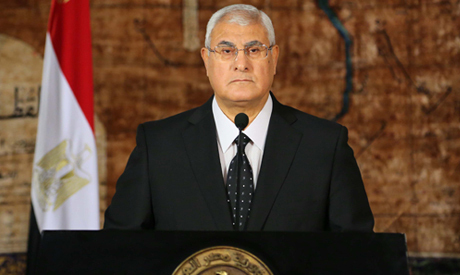 Interim President Adly Mansour announced on Sunday the formation of a fact-finding committee to investigate violent events following 30 June protests. Mansour's announcement came during a national dialogue meeting with several political factions to discuss the country’s transitional road map. Khaled Dawoud, spokesman of the Liberal Constitution party, told Ahram Online that Mansour's announcement came after Dawoud stressed during the meeting the importance of enforcing the rule of law by looking into violent events after the ouster of former president Mohamed Morsi on 3 July, including the violent dispersal of the pro-Morsi Rabaa Al-Adawiya sit-in. The dispersal of protesters at Rabaa Al-Adawiya unleashed days of violent street tumult, prompting a state of emergency to be imposed across the country, which ended three months later. More than 1,000 people, mostly Islamists, have been killed since the removal of Morsi in 3 July. Upwards of 100 security personnel have also died in the violence. Earlier in September, Egypt's cabinet commissioned the National Council for Human Rights (NCHR) to collect and record data from the events that followed Morsi’s ouster. The committee was formed on 28 September. However, according to Dawoud, the newly announced committee is more official saying the NCHR has no judicial power. Dawoud, a former spokesman for the anti-Morsi opposition bloc the National Salvation Front (NSF), resigned from the NSF in mid-August to protest the group's support for the violent dispersal of the two large protest camps established by Morsi supporters. In October, he was assaulted by pro-Morsi protesters who stabbed him in the chest and hand. Dawoud "resigned from the NSF to protest the group's support for the violent dispersal of the two camps" it say's above. And what happened an Islamist stabbed him. I would hate to know what would happen to him if he had not resigned! An alleged Islamist stabbed one person, injuring him lightly. But the secylarist gang ,urdered five thousand people, and not a single killer has been arrested or let alone prosecuted. These fascists are already releasing all the criminals who were responsible for murders and massacres in 2011, these thugs will continue the tradition of corruption in Egypt. You need an investigation??? Here is the result free of charge. THE TERRORISTS OF THE MUSLIM BROTHERHOOD. How hard is that to figure out?????? If you want to find the criminals, just look who is not in jail and who is in charge.